Hello and welcome to CASEing the Catty – Sunday Blog Hop for CTC116! Whether you’re joining the Hop here at CreativeJax with Jackie Noble, or if you’ve hopped on over from Kelly at My Papercraft Journey – a BIG hello! This week the CASEing the Catty Blog Hop and Challenge is taking inspiration from pages 20 – 31 of the 2017 Stampin’ Up! Occasions Catalogue. This section features the popular Succulent Suite of products and some other sets on my “must-have” list – Beautiful You, Dragonfly Dreams, Mediterranean Moments, Custom Tee & Tie Dyed … a fabulous section of the catalogue! Once you’ve had a look through this week’s Blog Hop to see plenty of inspirational projects that the crew have created for you – get your crafty mojo out and join the challenge at CASEing the Catty Blog Hop and Sunday Challenge Facebook Group. if you haven’t already joined the group you – just ask and your wish will be granted! You don’t need to have a blog to join in – just post your picture to the Facebook Group in the Album for this week’s challenge (CTC 116 – Succulents). If you do have a blog – feel free to add the link! And of course, the challenge is open to all Stampin’ Up! enthusiasts – not just demos! And you don’t have to have the same stamps, papers or colours that are in this section as you are taking inspiration from something – not recreating it. There are 40 projects on this week’s pages – so no shortage of places to start! In fact, with so much choice I found it hard to know where to start! I have a small confession – I must be one of the few people who have not purchased the very popular Oh So Succulent stamp set and coordinating framelits! I love seeing all the projects made with these – it just hasn’t yet got to the top of my rather long wish list! So I’ve chosen to take my inspiration this week from some of the other fabulous projects and products on pages 20 to 31. And I started with the large card below. It was the Creative Inkers Team Camp this weekend. Unfortunately, I was not able to attend at the last minute – but I had signed up for a couple of swaps! I know they will have had a weekend full of fun and inspiration and motivation and crafting and laughs! If you pop back on Wednesday you’ll see a project for one of the swaps I was part of, but today I’m sharing my Pocket Page swap. It’s the first time the team has done a “pocket letter” type swap and I was super keen to participate – I love trying something new! I did some research on Pocket Letters™ (an idea initiated and Trademarked by Janette Lane) to get a feel for what these were about. There were lots of styles – but essentially you create cards for the pockets around a particular theme or stamp set or colours. You can create a scene across all the pockets or they can be individual cards. You can decorate both inside and outside the pockets. You pop something behind each card – tags, embellishments – and of course a letter! I decided I wanted to tie the four cards together through their backgrounds and decided to look for a project in pages 20 to 31 that I could CASE. I’m a little pressed for time at the moment, so I’m all for optimising my projects – two birds with one stone as they say! There’s lots of inspiration in these pages but I was drawn the larger card on page 26 – the one with the two large dragonflies from the Dragonfly Dreams Bundle – and used it as my starting point. I liked the original colours – I think that’s what drew me towards the card in the first place. So I kept those – but added the others colours from the Cupcakes and Carousel product suite. I also love the colouring of our copper foil and embossing powder and wanted to include those in my colour palette. I’ve used three pieces of paper from the Cupcakes and Carousels DSP stack to make the background. I made this as a complete 6″x8″ page using one 6×6 page as the base and adding a strip of diamonds across the top. To create a similar dotty pattern at the bottom, I tore another paper (one with little dots) in a curve and adhered it at the lower edge of the centre panel. Some dots were stamped in Versamark and copper embossed. Then some flecks and other marks were added with glue and also copper embossed to give a grunge look to the background. I then cut this into quarters ready to decorate each. The top right and lower left pocket cards were decorated in a similar way to the original card on page 26. I’ve copper embossed the centre of one of the Falling in Love Embellishments to adorn my copper foil dragonfly. There’s a Peekaboo Peach set of wings under the stamped dragonfly, and more embellishments on the top – a flower from the Sending Love Embellishments and Pool Party Baker’s twine from the Cupcakes and Carousels Embellishment Kit. The top left pocket card top inspiration from the Happy Birthday card on page 27. The bottom right pocket card takes its inspiration from the card on page 26 with the little dragonflies. Copper again of course though! I added the large Bermuda Bay dragonfly to the front of the pocket page in keeping with the one sitting with the framelits at the bottom of page 26. Mine is way more sparkly though – it’s cut from the gorgeous new Sale-A-Bration Glimmer Paper Assortment Pack. This is one of 3 new items available FREE with a qualifying order from 21st of February. With 12 pieces of 6″x6″ (4 each of Bermuda Bay, Mint Macaron and Sweet Sugarplum) there’s a whole lot of sparkle in that pack! Now – let’s have a look at the reverse side. The little card (where I’ve written my letter) is based on the bee tag from page 26. The crosshatching pattern comes from the wings of the dragonfly – I partially inked them with an Early Espresso Marker to get part of the pattern. 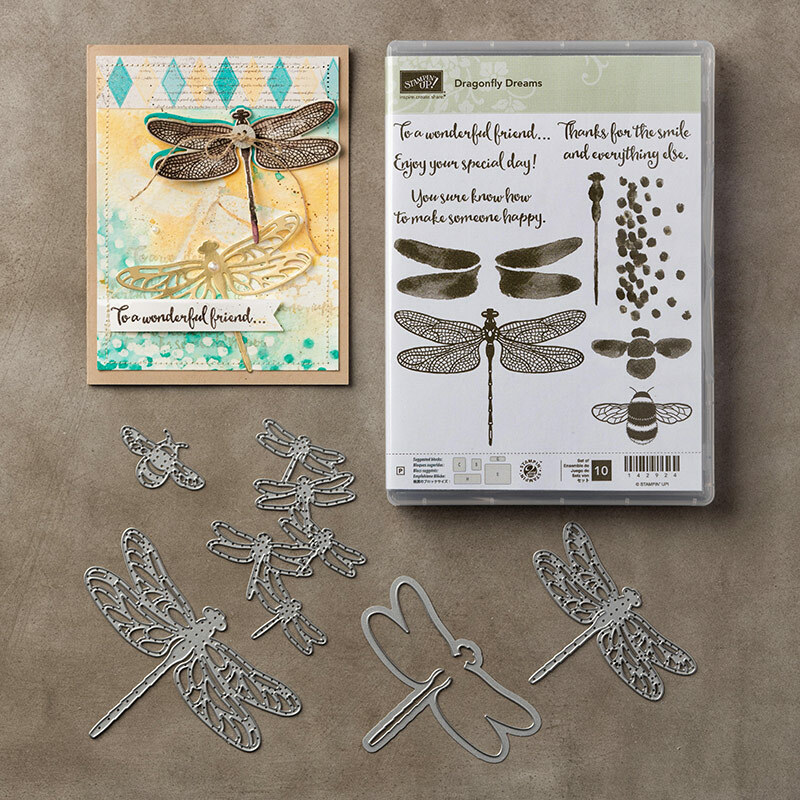 The tags are inspired by the That’s the Tag projects on page 23 of the Occasion’s Catalogue – but with dragonflies of course! Sparkly AND copper – what more could you want?! What fun project my CASE was this week. I am looking forward to receiving my Pocket swap back and hoping the recipient of this one enjoys receiving it as much as I did making it! Feel free to leave me a comment in the section below – I love hearing from you! If you live in New Zealand and would like to purchase any of the products I’ve mentioned – I would welcome you as a customer. We’d love you to share your own project that takes inspiration from pages 20 to 31 of the Occasions Catalogue, Just click on the Join Challenge Button below and you will find yourself at the Facebook group where you can add your project to the album for this week’s Challenge. You have almost a week to create and join in. Make sure you put your photo in the challenge album by 6pm Saturday 25th February to be included. Wow, what an amazing project Jackie. So much eye candy, it is hard to take it all in! WOW, your pocket pages are a feast for the eyes, there is so much loveliness going on I don’t know where to look first! Wow, so so beautiful and what a fabulous way to use lots of those gorgeous dragonflies. Wow! How clever is that. Love it Jackie! Oh Jackie, you’ve done some AMAZING work here this week! Well, most weeks ,it’s amazing, this week it’s extra special. What a clever idea, really intrigued by the Pocket Letters. Thanks for sharing your amazing project/s Jackie.